Q: I bought a mesac porsche 917 body on Ebay. When I got it I realized it was not an exact reproduction of the mesac 917. The body is smaller in all dimensions and is not made like the original mesac bodies were. Do you have any or make any of these for sale? A: The problem you are seening is shrinking of molding materials. A problem that TrueScale bodies do not have. Allot of repo bodies suffer fron this problem. You may also be looking for that true MESAC look that came with all original MESAC bodies. I too know what you need. I have “new” old bodies and reproductions of most MESAC bodies (some from the original molds). Question: Can you add anything to the Cox GT40MkII Prototype thread at SF? Q: Victor. Have you read Slotforum lately? Again, someone is asking about the Cox Ford GT40 MKII Prototype. The one that was never made. I ask because of your connections in the hobby then and now like with Philippe, Ben Brandt or Sal from Cox and because of what you know about prototyping. What do you think is going on? Why do you think someone would keep posting under two different names to defend the so called prototypes he has and sold? Why don’t the photo’s of the prototypes he has now posted at Slot forum appear the 1999 Vintage Slot Cars book? Where he states “here are pictures of the sole, pre-production, actually MOLDED Cox Ford MK2 in existence, and one of the world’s most valuable slot cars” (He stated somewhere that he got this one from Cox while he worked there). But then some others chimed in and it was discovered to be a Fujimi body and not what a Cox body. Then the pictures disappeared (the thread is still there). Why don’t you post something there? A: First let me say that It is not my intention to disprove anyones claim to have any prototype. I have read last years thread (and seen the pictures. They are still published on the web) and, I have read more of the topic “Cox GT40 MKII” in different ways since. I have chosen to not post at SlotFourm on the subject because the moderators (and most others) know how I feel in regards to Philippe not to mention the legal issuses we have with him, and would certainly not allow my input on this there. Nor do I wish him or anyone any more angushish and embrassment over this issuse. I do have some information to add there but have to add it through private PM”s or emails. I feel it is now a bad subject. Not only do we not get to see the actual prototype but we have clearly seen what most are calling “fakes”. Now… I had a business friendship with Ben Brandt (and some NOS other slot car collectors/Dearlers) for a few years from about 1987 until he pasted away. He never told me his Cox GT40 MKII was made for him. 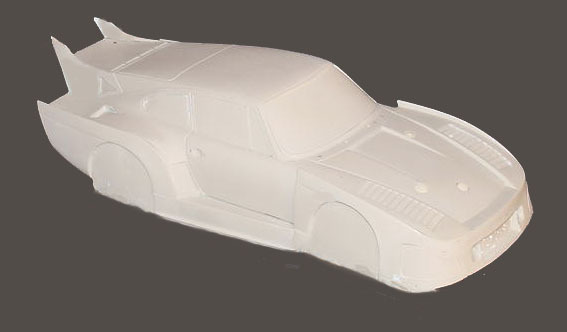 Since I know the prototyping industry I didn’t feel it was a “Prototype” from 1966.
in 2004 “I did not see another slot car race until 1994″ And in a email to me stated he left the slot car world only to return in 1992.
that is probably why I did not meet him while dealing with Ben. I met Philippe through Lloyd Asbury of A W ModelCraft in about 1997 (I think) Lloyd asked me for a favor to make some reproductions for Philippe. I did a small amount of reproduction work for him for a sort while. Please Note: If you are woundering about the reproduction of original items such as boxes, packaging and documentation he was making at the time, I had no part in the production of those items. Sal worked for Cox for many years (until 1976) then Leisure Dynamics for about 6 years. He became a very good friend of my Dad after leaving there. My interest in prototyping began at an early age. I seen allot of mold/prototype work going on as a small child as I got older I began to practice the trade myself as a hobby mostly. I hung around shops in my area as much as I could. In 1997 when I moved to Orange county, Ca I began hanging around Lloyd Asbury’s shop. The last time I had done that at Lloyds was back when I was about 9 years old. What everyone has seen one the cover of Car Model Nov 1966 is the actual prototype. Only one was made. Standard practice when time was short. Most prototypes in the late 1960’s would have been almost “mock-ups” Competiton to be the “First” to release a model was great back then and still is some what. If I was the Craftsman back in those days I would have gone back to the GT40 master (made from wood) and made the changes to it to make the MKII version. Working on a much larger scale is not only easier but much much quicker. Then the prototype body pattern could be made using the Deckel pantograph. This process can be seen in the July 1964 Rod and Custom Models magazine pages 18-21 “RCM visits Revell” and most recently in Scale Auto Enthusiast magazine’s April 200 issue pages 68-72. This was made as I mentioned above. Then given wheels/tires and a paint job. This is an actual prototype model I kept bare. One of a few that were used by Jim Russell of AFX/Racemasters to introduce the “New Cobra” to the Hobby industry at hobby shows a few years back. What this shows is that Mr. Russell asked for the project to be done this way. Why? Because that is what he learned and knew about making prototypes. A practice used throughout the industry back then and still sometimes today it was also the quickest way. It was made from a “4-up” master that was made from Jelutong wood traced by the Deckel milling machine. A rubber master was then made of the new HO master and a few casts were made for an artist to paint. Here is a modern prototype made for the Brumos Porsche company. It is 1/18th scale. Made for display and photos. Although this was created using a computer, the result is the same. Wheels and tires would be added, paint and some details. A shortcut would have been to use a molded GT40 canopy and windsheild to fit the MKII model prototype. Many have debated that the car is off center. Meaning it has no guide. I have said it has no chassis as well! That is because it is a prototype. A mock-up. Pretty much a solid block of material. Ever since the 1970’s people have been making slot car reproductions of many items found in magazines or books some for profit and some just to have as back in the day. Some items were very good and you could not tell it was a reproduction. That… could also be the case of the recent Cox GT40 MKII prototype’s floating around. I am willing to bet that most Cox prototypes for any item, were placed on display in the office of Roy Cox and when he left the company they left as well. The GT40 MKII in the collection of Osvaldo Pace is by far the best and if any MKII was made as a shell by Cox it may be the one in Osvaldo’s collection. Self-interest has a powerful tendency to disable our objectivity and befuddle our ability to live up to moral principles. And when we think our financial or physical security is at stake, the best of us are vulnerable to reason-crippling self-delusion and self-righteousness. The greater our self-interest, the more likely it is that we will slam our minds shut to other perspectives and defend our positions with ferocity as if the intensity of our convictions makes them more valid. Now, you can ask me if I know where that stuff is. I am sorry about how I write and spell I only learned about girls in school. a Russkit “SUPERLEGGERA” series body, is made with Female vacuum plug assist forming molds. Superleggera’s were all made this way. It is the “Flange” that shows it’s a Female rather than the under roll (or tuck) needed in blow molding process molds. Q: My visit to California was good. I enjoyed see all of your slot car related parts and bodies. I do realize that I missed seeing allot of what you have and what you no longer have. I was just thinking, have you considered donating most of your items or some of them to the museum down your way? A: Thank you for your visit and your email suggestions. I’m sorry you have been under the impression that there is a slot car related museum here in So. Cal somewhere. Asking to donate your slot cars or slot car items by a person has been the same claim for years. All the while you don’t realize you will be giving your things to a personal collection and sometimes they might be sold from there if the price is right. That is just one reason I do not donate “ANYTHING”. This is the comment from a person very close to a collection about two years ago “We are putting together the largest slot car collection. It will be my private collection. Question: Ron Hersman just came out with bodies just like some of yours. What’s going on? Have a look at the IRRA website to see them. Answer: I have done work for Ron and have always taught of him as a business friend. My best reply to you is that the Retro body market is really open to all because it involves reproductions of old bodies not found any more or hard to get. The bodies you are emailing me about most likely are direct copies of my bodies (apparent in one of the photo’s). My only hope is that I have not upset Ron in some way. In the mean time I am hoping that some good would come of this and I get fewer orders because of the new bodies available from Outisight. I also will continue to respect Ron and his line of bodies. I hope helps clear-up your concern. Question. Do you make any of the more scale Lancer bodies? Yes. I have made quite a few different ones. Please let me know which one you need.